love that you do this for us. i have every one of your cookbooks!!! Hi! I love all of your recipes and it’s helping with meal planning and shopping! I started WW 3 weeks ago and have lost 11 lbs. Your meals have made it possible. Thank you so much! Is there any way you can post your meal plans on Friday? As a working mom, I have to make my list Friday after the kids go to bed and grocery shop on Saturday! I have been going back to previous weeks, but it would be nice to do it at the same time with the Facebook community. I understand if you can’t, but I thought I’d ask! Thanks again and I appreciate all you do! 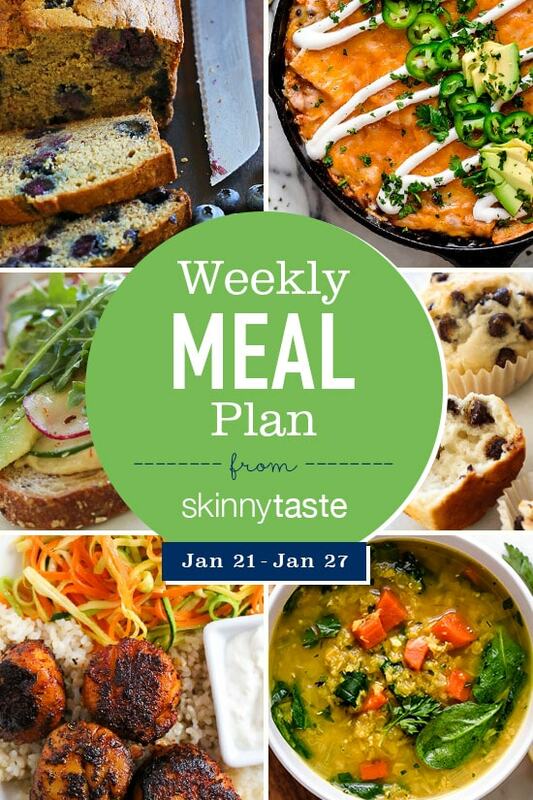 I love your books and your recipes and I can’t believe I’m just now finding these meal plans! I am so excited. Thanks so much for providing such an awesome resource! Love Love Love these meal plans! they are affordable and reasonably easy to cook which I appreciate. With our busy schedules they sometimes even last 2 weeks if we find ourselves eating out and or because we have leftovers! please keep up the weekly meal plans! I love these meal plans!! I use them all the time! Thank-you for these! ???? Your meal plans inspire me to try new foods that I would normally not eat!! I actually enjoy cooking when I know what I’m making! All thanks to your meal plans that take the decision making away! Thank you so much for sharing them! Thanks for sharing. 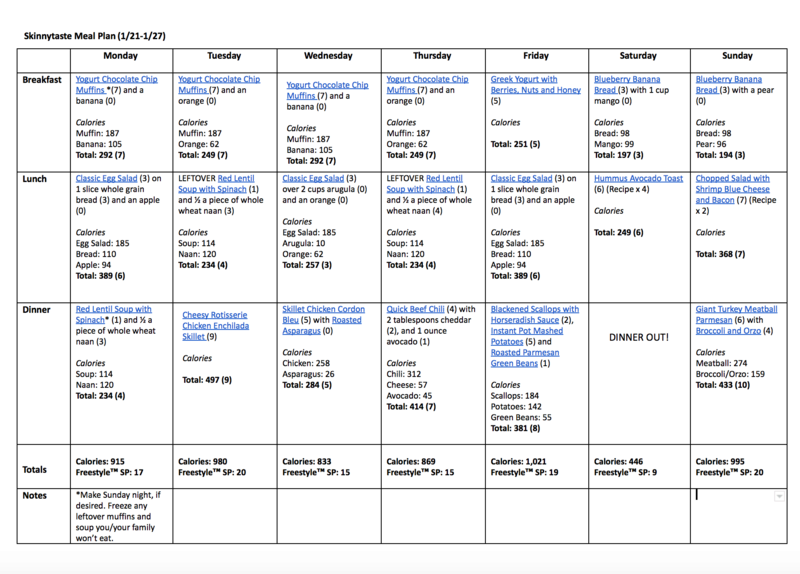 I will be using your meal plan this week to see how it works out with my schedule and life. This may be my new go to for grocery day! Much appreciated!! Thank you so much for making these plans! I’ve been using them now for a few months and I absolutely love them! I’m not on any diet, so I don’t count the calories or points but I do want to have a more balanced and healthier way of eating. I like to use them as a guideline and then play around a bit as sometimes the products you use are not available here in Finland. But I often have leftovers from previous days, so can use them up or then I check for some other recipe that uses up the products I have at home! Really looking forward to see what next week has to offer! Your meal plans are a complete lifesaver! Thank you so much for taking the time to help make our lives easier and healthier! I saw that your new air fryer book is coming out soon. Woohoo! Is you air fryer still going to hit stores in March? I’m dying to get one, but am holding off to get yours if it’s still in the works! Gina, thank you so much for these weekly meal plans. I’ve been following along with them nearly every week for some time now, substituting a meal here or there with recipes from your cookbooks. My husband and I have particularly loved this week’s menu – he just proclaimed – as he has a time or two before- that he’s a “skinnytaste man!” Suffice it to say, you’re a welcome addition to our home. Thank you for making your recipes publicly available and sharing your weekly meal guides – it’s definitely appreciated! Made this week’s chocolate chip muffins & my picky 8 yr old son and his friend devoured them!!! They didn’t know they were “healthy” muffins! I’m just curious though, in your shopping list you have pears listed, but what recipe are they used in this week? You are a gift for doing this! I’m so grateful for how much this helps me and how delicious your recipes are. You use ingredients that I do not normally cook with (I.e. cauliflower, sweet potatoes and lentils) but I’m trusting the recipes (like how we sometimes have to just trust our GPS when aren’t so sure) and I have been so pleasantly surprised (no dirt roads or dead ends!). Thank you so much for what you do! I always struggle with meal planning but feel so much better when I do it! Most of the time, I just can’t come up with any ideas and MANY times I check out what you have on your weekly meal plan for ideas! Thank you! Please continue to post these weekly menus! They are a great tool and motivator! Great how you leave “wiggle room” for extra points too! Thank you for this and please keep posting! It is my first week following your meal plan but I have already made the red lentil soup and the muffins and both are incredible! Looking forward to cooking healthy in the weeks to come. Thank you so much for your weekly meal plans, just love them and don’t know what I would do without them. I have just bought your meal planner book and am loving it also. You are doing a fantastic job!!!! I definitely use them! My husband is picky so sometimes I have to make swaps but it is a great start for my meals each week! I love getting these plans! Please continue sending them! Amazing! Love that you are doing this. I lost 25 pounds on WW 9 years ago and have been creeping back up the last year due to having two busy teenagers, a puppy and being 48 yrs old. It has been so much harder to plan than the first go-round. This is s life saver! Thank you!! Pregnant so will not be able to continue with weight watchers, but your meal plans always help me stay on track so I plan to keep using them to stay on track! The grocery list is also a wonderful bonus. I was just looking at your meal planner online. I looked up the fooducate app and would you believe it says it isn’t available in Canada. I have never heard of an app that doesn’t work in other countries. These are sooo amazing PLEASE KEEP POSTING WEEKLY. I AM A SINGLE USER FOR WEIGHT WATCHERS AND I NEED THIS IN MY LIIIIFFEEE. ???????????? Thank you for all the work you put into these weekly meal plans! Everything sounds amazing and the things we’ve made are so tasty! I appreciate all you’re doing! Thank you! This is the help I needed! I appreciate the weekly menu! Love the variety and appreciate the single serving sizes! You have organized them so well by different diets and complete with grocery list! What’s not to love?!? Thank you for doing this – it’s awesome! I love your meal plans! They are well organized , good recipes, and the grocery list is awesome! I would love to see them continue! I’m trying to eat healthier and lose weight. Living alone, I appreciate you sizing your recipes for one, instead of having to make a ton and figuring out serving size and freezing leftovers. Thank you for all your hard work on this! So glad you are liking them! This is amazing!!! I really appreciate you putting in all the effort to post this plan and all the accompanying info. Thank you so much! Can’t wait to do it this week.